In the Nazi-Fascist persecution, an Italian village became “House of Life”. When the Nazi-fascist persecution intensified in 1943 and 1944, a mountain village in the center of Italy became a “House of Life” to welcome a persecuted Jewish family. Terzone di Leonessa, a town that today has 340 inhabitants, near Rieti, made a real feat by risking the lives of its men, women and children to give home and food for months to the five members of the Pisetzky family (the mother, the father, two teenage sons, and grandmother), who fled Rome to escape safe deportation to the Nazi death camps. 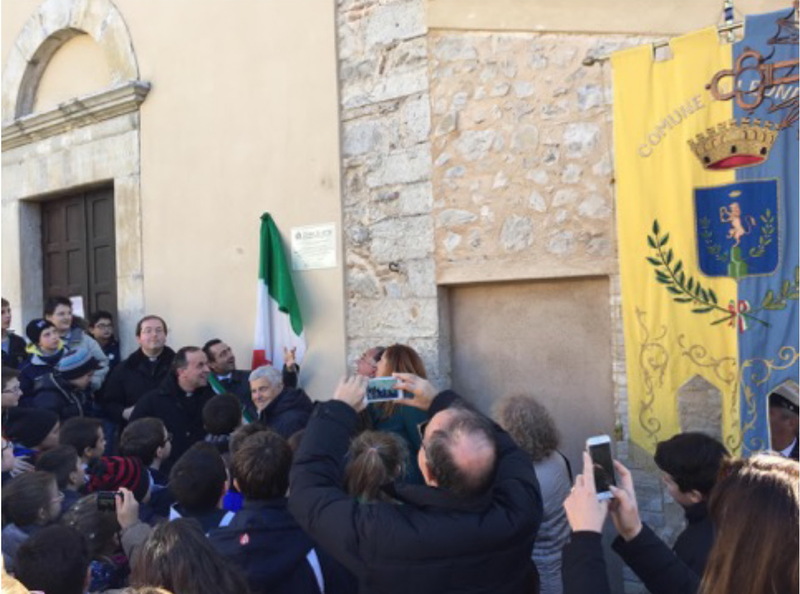 For this reason, in an emotional celebration, which gathered on December 21st the inhabitants of several of the nearby towns, the International Raoul Wallenberg Foundation gave the “House of Life” recognition to the Church and the parish house of San Pedro, where the family found refuge. “I want the example of our grandparents and grandmothers to be a teaching for future generations, educating them in the values ​​of human dignity, respect and mutual tolerance,” added Trancassini. The Bishop of Rieti, Monsignor Domenico Pompili, acknowledged the pedagogical importance of this initiative of the Wallenberg Foundation and proposed to the inhabitants of the village to repeat the example given by their grandparents, welcoming one of the thousands of families who today flee from the persecution, seeking refuge in Europe, as Pope Francis has requested. Actually the events that took place in Leonessa during the Second World War have been reconstructed thanks to the testimony of Marco Pisetzky, recently deceased, one of the two children of the refugee family. Pisetzky, in January 2013, returned to Leonessa to revive along with the local population those months that, paradoxically, in his adolescence, were “the happiest of his life”, because in the middle of the persecution, the population offered him a extraordinary welcome. Marco’s family, of Polish origin, came to this village at the suggestion of one of the ladies who worked as a servant in their house in Rome, who put them in touch with the pastor of the Church, Don Lorenzo Gnocchi. The inhabitants of the place knew that the Pisetzky were Jews. The partisans fed them at night. The ceremony was attended by Professor Andrea Ungari, professor of History at LUISS-Guido Carli University, who illustrated the value of the peasants: on the one hand, they risked reprisals from German soldiers if they discovered that they were hiding Jews. On the other hand, the peasants denouncing the Jewish family could have received a reward and grown in recognition by the occupation. And yet, as Ungari continued, none of those humble mountaineers, who spent a moment of serious shortages and difficulties, betrayed the Jewish family. It was the solemn opportunity for this mountain population to join the Jubilee of Mercy that Pope Francis has called. The Wallenberg Foundation, presided over by Eduardo Eurnekian, and founded by Baruch Tenembaum, presented this recognition in the form of a gravestone, which was placed on the facade of the parochial church of the little town. The project “Houses of life” not only recognizes the example of people who gave refuge to persecuted during the Holocaust, but also in other situations of persecution and genocide, as happened in the case of the Armenians, who sometimes could be saved thanks to the generosity of Turkish citizens.